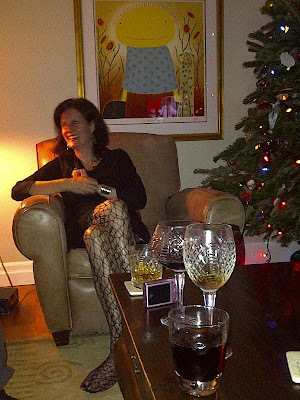 Happy, Happy New Year.....no....those 4 drinks are NOT all mine, but apparently C-A requires 2 at a time.....Patron in one hand and my famous dirty martini in the other! Had a wonderful get together last night including dear family, dear friends and an international guest or two. The event concluded with a lively Canadian/Lithuanian sing-off....who knew! Funny thing was that of the 11 people sleeping in our home last night, I was the last to bed and first up by HOURS! Perfectly coherent as well. Was quite entertained by the youngest ones starting their day (barely) at 11:00, 12:00 and approximately 2:00 respectively:) I thought those 20 somethings were supposed to be able to handle all kinds of partying.....pshawwwwwww I say! Husband and I have enjoyed a lovely low-key day filled with my downloaded episodes of 'The Middle'...my FAV newly discovered show. PLEASE watch it. Also reading a fab book today 'Predictably Irrational' all about how people let things affect them like price, perceived value, etc.... Along the lines of a Malcolm Gladwell book. I have always understood how certain details contribute to the overall experience of life. I drink something/anything/wine/water/etc., EVERYDAY out of my hand-made crystal. It just elevates the event. Please don't have special things only to lock them away for special occasions. Use them every day and enjoy them.